During the summer months, freshly ripened cucumbers can be a delicious and healthy treat. Cucumbers have several unique properties that make them an ideal food for seniors to eat. 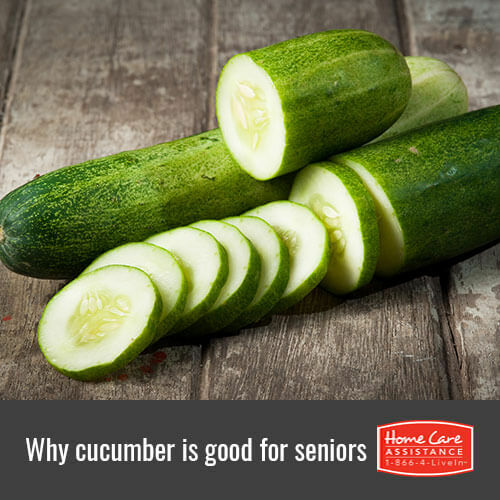 Following are a few reasons why providers of senior care in The Grand Strand should incorporate more cucumbers in senior diets. Cucumbers are a great source of fisetin, which is an anti-inflammatory compound that protects the cells of the brain. A 2014 study published in the Aging Cell Journal found that mice that ate a lot of fisetin had a significantly lowered risk of Alzheimer’s disease and other age-related cognitive diseases. A cucumber contains just as much potassium as a banana. This essential nutrient is crucial for maintaining and regulating water and sodium levels in the body. Eating a potassium-rich diet lowers blood pressure and helps prevent heart diseases and stroke. In addition to being delicious, cucumbers have an extremely low calorie count, which is why seniors can snack on cucumbers for hours without worrying about their waistline. This helps seniors avoid obesity that can cause a myriad of secondary health problems like diabetes. These refreshing vegetables are packed with antioxidants, including polyphenols, beta-carotene, flavonoids, and phytonutrients, which help to prevent oxidative cellular damage. Since damaged cells can eventually mutate into cancerous cells as people age, the antioxidants in cucumbers may lower rates of cancer. Stress doesn’t just affect the brain. It is also a physical response to outside triggers that raise levels of cortisol hormones. Cucumbers contain biotin, vitamin B1, and vitamin B5, all of which lower cortisol levels, and consequently, stress. It’s important for seniors to avoid stress as prolonged experience with it can lead to anxiety, depression, weight gain, and more. Cucumbers contain a lot of soluble and insoluble fiber, which is a critical part of the digestive system. Fiber that seniors get from cucumbers can prevent upset stomachs, bowel disturbances, and bloating. The relatively high fiber levels in cucumber may even help to reduce risks of gastrointestinal cancer and other digestive illnesses. Make sure your loved one is eating nutritious foods with help from Home Care Assistance of The Grand Strand. Our highly trained live-in and hourly caregivers in The Grand Strand help seniors prepare nutritious meals in order to promote healthy lifestyle choices. Additionally, they help your loved one maintain other aspect of daily life including personal care, housekeeping, grocery shopping, and more. Learn more today by calling (843) 353-3105 to schedule a no-obligation consultation with a friendly Care Manager.